What a Lady Sleuth Needs: clues, corset…and dessert! 5. a bracing cup of tea, to fortify one’s courage before confronting a suspect in a lonely tower at midnight. 6. a dessert table, where our lady sleuth can congregate with potential witnesses or suspects. Sweets are sure to coax even the most reticent to drop one’s guard. Speaking of desserts, I’ve been asked by fellow mystery writer Nancy Lynn Jarvis to contribute to a mystery author cookbook she’s compiling. Squee! When I thought about it, I realized that my Concordia Wells series really does have a fair amount of eating going on: dances, teas, picnics…wow, who knew? And of course, Concordia has a special fondness for desserts. So I’m submitting two for the cookbook: a Charlotte Russe and a pumpkin creme brulee. Charlotte Russe is a 19th century dessert, created by a French chef in honor of his Russian employer, Czar Alexander I (hence the “russe”). There is some disagreement about the “Charlotte” part of the name: some say it is for the czar’s sister-in-law, Queen Charlotte, and others say it is a corrupted form of charlyt, an Old English term for a custard dish. 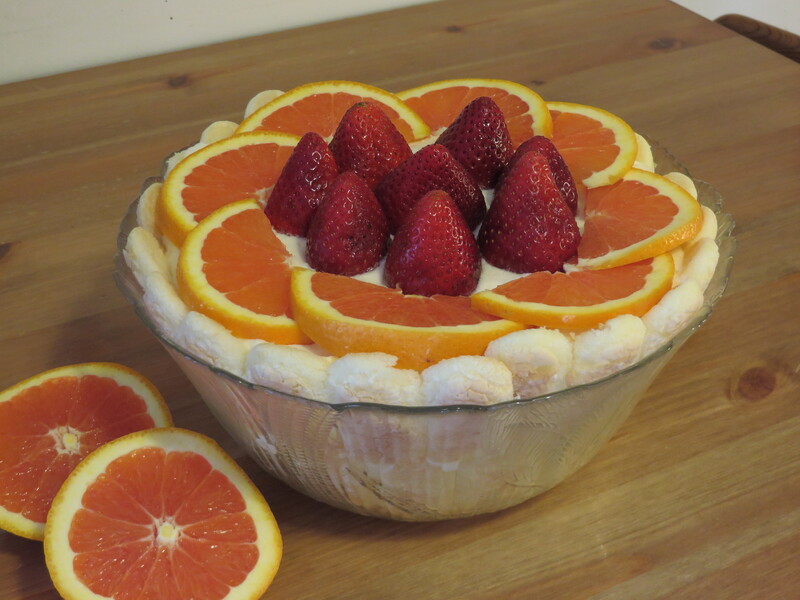 There are many variations of the dessert, but most of them involve custard, lady fingers, liquor, and fruit. New York bakeries in the 19th century created a “to go” form of the dessert, with sponge cake, custard, and a maraschino cherry on top. It was put in a push-cup that folks could carry around and eat from. 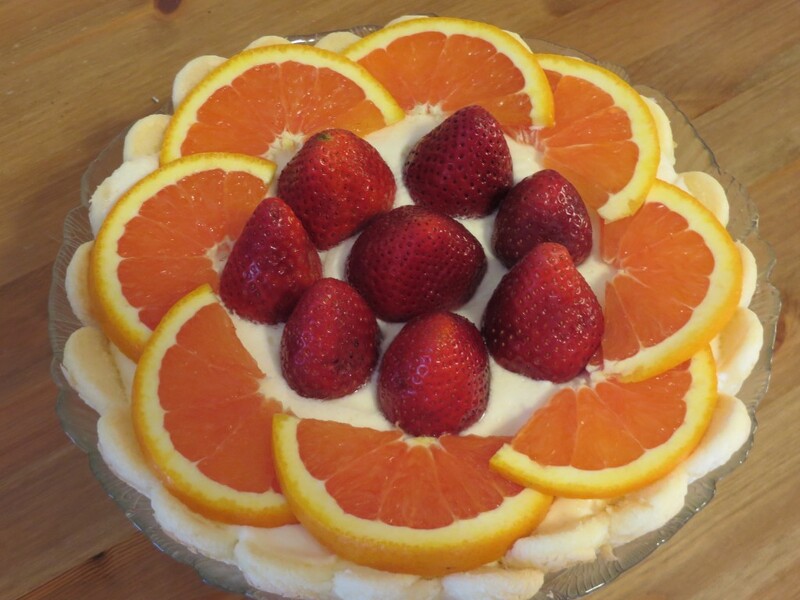 Garnish: fresh fruit of your choice – strawberries, peaches, berries, orange slices, etc. Cook gelatin and water mixture on low heat until gelatin is dissolved; remove from heat to cool a bit. Meanwhile, beat sugar and egg yolks until incorporated and smooth. Whisk in liquor. Whisk in gelatin until incorporated into the egg yolk mixture. 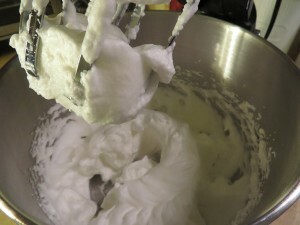 In a separate bowl, beat egg whites until stiff (don’t overdo it; you don’t want them to be dry). 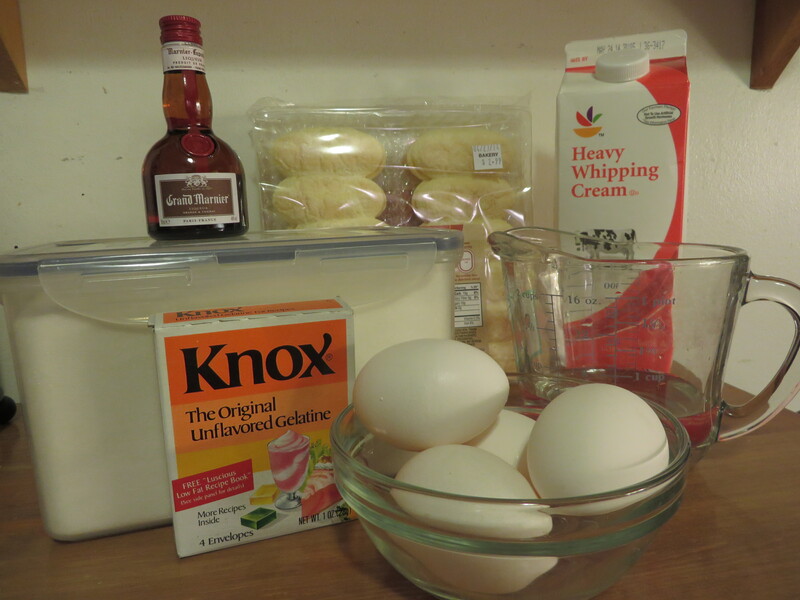 Fold egg whites into the egg yolk/gelatin mixture. 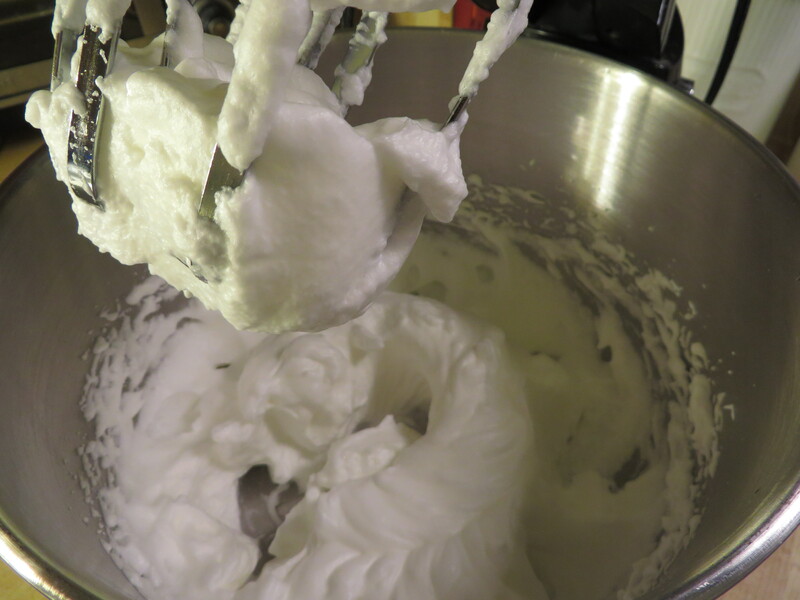 In a separate bowl, beat whipping cream into soft peaks. Gently fold into the rest. Line a glass bowl (3 qt size) with lady fingers (split them first, nice sides facing out). 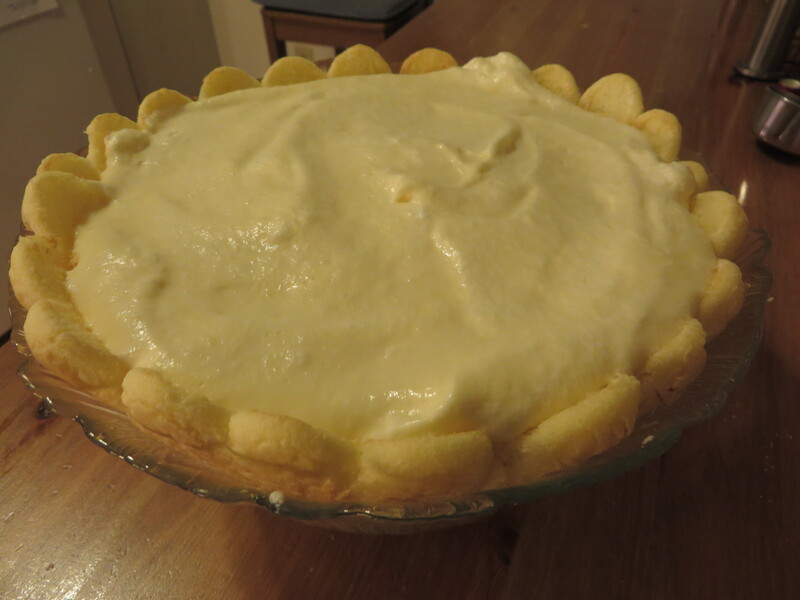 Fill gently with the cream mixture, being careful not to dislodge the lady fingers. 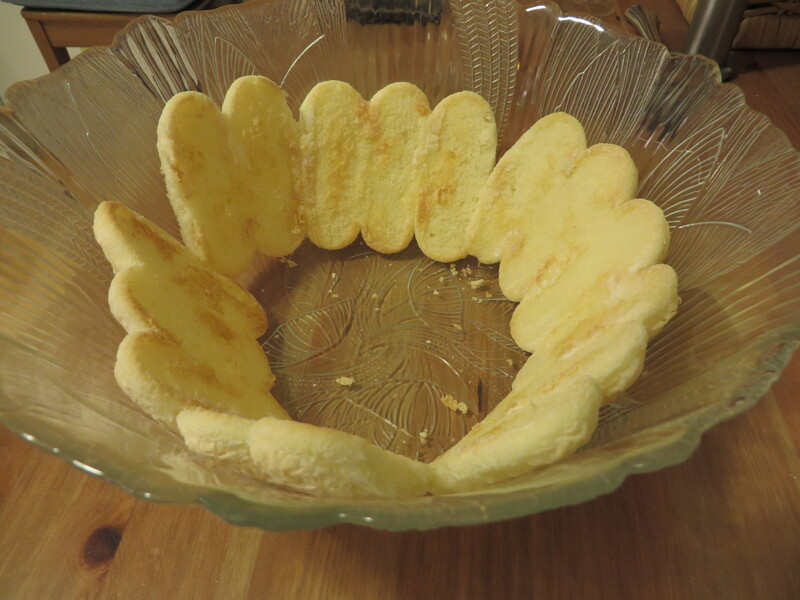 …the first row of lady fingers. I put a second row on top of this as I filled the bowl. Cover; chill overnight (at least 8 hours). If desired, garnish with fresh fruit just before serving. I hope you’ll give Charlotte Russe a try! Do you have a favorite dessert from a novel you’ve read? I’d love to hear from you. Marcy, you can tell your husband on my behalf that he doesn’t know what he’s missing. Custard is good, but when you add alcohol into the mix, you have a bowl of deliciousness. I love the idea of this cook book. I have a cook book entitled “Presidential Cookies,” which contains the recipes of (supposedly) each President’s favorite cookie. Some of those early guys recipes had to be adapted of course because some of those ingredients aren’t available anymore. I’ve tried a couple of them and they’re pretty good. Fun fact – President Lincoln apparently loved gingerbread boys (men). They didn’t show that in the movie! Best of luck with the cook book. And with Concordia’s new adventure. What a great idea for a cook book. And what a nice compliment being asked to contribute Kathy. That look delicious girl. I like custard and ladyfingers. And it doesn’t look too involved. I like it! Yummy! Thanks, Karen! It’s a very basic recipe, which means that the individual ingredients have to shine on their own merits. I made sure I used quality ingredients, such as organic eggs, and freshly-made lady fingers. Dessert should come first in a meal in my opinion. Your deserts are beautiful. Thanks for sharing! Haha, Deborah, I’m sure the list could be even longer…. Your chocolate concoction sounds delightful. I’m with you about a little sweetness going a long way!